When toddlers start hitting, many parents grow concerned and ask me, “What should we do?” It inspired me to write this blog entry. I want to mention that each situation is unique and needs to be looked at individually. This blog post will summarize a few main points and ideas. Sometime between the ages of 15 months and 4 years, children, to the biggest surprise of their parents, may start hitting their family members. First, I want to reassure parents that it is developmentally appropriate. And in most cases there is nothing “wrong” with the child or parent. Research shows that the human brain fully develops self control by the age of 21 or even 25. However, this statement doesn’t mean we should let it go and allow the hitting. Children who are allowed to hit their parents feel uncomfortable and unsafe. Our role as responsible adults is to help children stop hitting and co-regulate. Certainly, we should keep in mind that each individual case is different and it is important to look at each situation separately. First you want to think about what the child’s needs might be. If the child wants something really badly, it is going to be hard for him to control himself. The child is demanding your attention. The child might be trying to avoid something dreadful to him. The child is scared and it is a natural reaction to the feeling of fear. The child is learning about independence and trying to learn about limits. The child is trying to make sense about what your reaction means, especially if he previously has experienced a big emotional explosion from the parent. 2. If he tries again, prevent the hit, by blocking or holding your child’s hand. Make sure you are firm, but not rough. 3. Say: “I will not let you hit me.” Pause. “Hitting hurts.” Use your normal-friendly voice. Again, you don’t want to sound upset or angry, or overly sweet. 4. After the second attempt, if the child is sitting on your lap, bring the child down from your lap and stand up. Let him know that you don’t like to be hit. In this situation you are letting him know with words and also with your actions. A. The child might want to talk. And you might need to do some more acknowledgment, narrating and active listening. For example, “I can see you had a plan. You thought it will be fun to use this water. You want to pour it there.” Point at the boat. Make sure to pause and listen. The child might express his feelings with words or maybe with sounds. Acknowledge and do some more active listening. B. The child might start crying. Show him empathy and support. You might say: “I hear you…” You can give a him hug or put your hand on his back gently. Stay close with the child if he wants you to be next to him. Some children need a bit of space when they are upset. In this case, move away a little bit and let the child know where you are going to be. Remember we are not trying to punish him or make him suffer. 6. Let your child process what happened by not distracting him with something new. Do not try to solve the problem by offering solutions. Allow your child to cry, giving him time to process the situation without distractions. Often the children will cry loudly, kick, scream, arch their back in your arms or throw themselves on the ground. It is important for them to be able to express and unload their feelings without your judgment, and for the parent to stay calm, grounded, present and listening. Do not hit the child back. 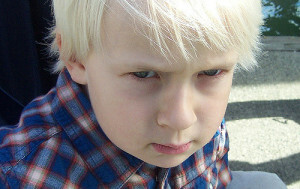 We are modeling for children which behaviors are appropriate, which are not, and how to deal with difficult situations. Do not pretend to cry. Your child will know that you performing and might actually find it interesting and want you to perform again. Do not shame the child. “We only do well when we feel good.” – Regalena Melrose, PhD. Make sure your child is well-rested and not hungry. It is much harder to control oneself when one is tired. Make sure you plan your activities wisely. Too many things in one day, one week can be over stimulating. Allow more time for transitions. Provide choices in your day-to-day routine: “Would you like to wear these shoes or those? Do you want to change your diaper now or do you need another minute?” Look for opportunities where you can provide choices. When everything is calm, learn relaxation techniques with your child, such as hitting a pillow, breathing, jumping up and down etc. Write a Social Story about what happened. Pre-play the situation at home using stuffed animals or dolls. The toys can feel angry, sad or frustrated. Inspired by psychologist, Anastasiya Umanskaya. 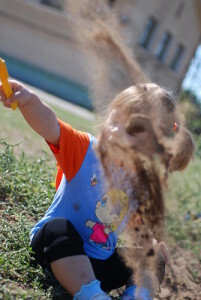 Photo credit (girl in sandbox): Elena Shachina.